Still looking for Christmas recipes ? Traditional roast turkey, glazed ham or cookies might have been on your list already. How about a spicy, quick dish that can be cooked on the spot to entertain your guest with no fuss? Apart from those must-have Christmas dishes to celebrate the season, as our Aussie friends love enjoying BBQ at the backyard, I’m thinking of making a different savoury one, that is suitable for catering a bunch of people in a festive party. This grilled veal with spicy tomato sauce doesn’t need any complicated preparation work and long cooking time. It can be whipped up on the go once you have done the minimalist preparation. The tender and juicy veal that freshly grilled on the spot will surely warm up the hearts of your guests and family. 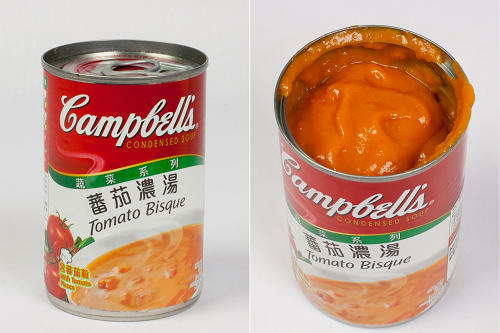 I often like to use Campbell’s soup to add more flavours in a dish. This time I used the Tomato Bisque, courtesy of Campbell's Soup Hong Kong, to whip up the sauce for the grilled veal, and added a mild spicy kick of chili. Cut veal against the grains into 20 dices, each about 1.5cm in size. Mix with marinade. Cover and chill in fridge for about 1 hour. Use a small sauce pot, pour in the tomato bisque and water. Stir in chilli powder. Cook on medium heat and bring it to a boil. Turn off the heat and keep warm. Set aside. Soak skewers in water for 15 minutes. Cut each slice of pineapple into 4 to 5 pieces. Wipe dry with kitchen papers. Remove marinated veal from fridge. Leave it at room temperature for a while. 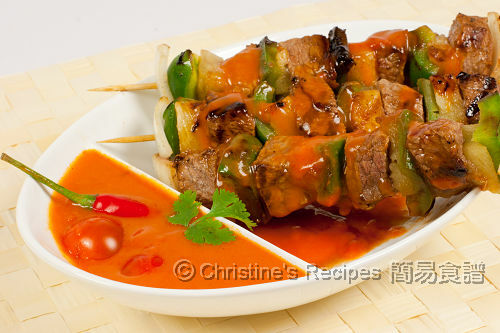 Skewer capsicum, onion, veal and pineapple. It should be 4 pieces of veal on each skewer. Grill on high heat to your preferred doneness. Ladle warm spicy tomato sauce over the grilled veal. Garnish with cherry tomatoes and red chilli if desired. You might like to substitute veal with beef fillet. The freshly grated pear can help tenderize the meat, also add a subtle sweetness. 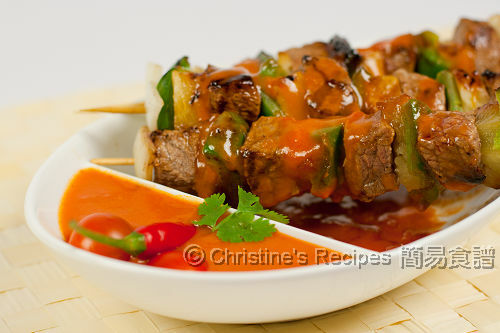 If you don’t want it spicy, you might reduce the amount of red chilli or just skip it while cooking the sauce. The sauce still tastes wonderful to go with the grilled veal. Wish you having a great time with your families, friends, and also with your hearty dishes : ). Happy Winter Solstice Festival and Merry X'mas! Another great looking dish using Campbells - you know that this dish would really be perfect for the holidays... it looks healthy too - especially after overdosing on so much ham and turkey... this looks like a great alternative. Happy Holidays Christine to you and your family. May 2011 bring you lots of happiness. What a gorgeous looking Christmas dish! It's interesting to use grated pear to marinate. I will try it out one day. Merry Xmas and Happy Holidays to you andyour family! Since Christmas in Australia is on summer, BBQ is perfect choice. Love the spicy tomato sauce! Merry Christmas & Happy New Year to you and your family, Christine! Mmmmm....looks delicious. I love meat on a stick :D Love the spicy sauce too. Merry Christmas and Happy New Year! This looks so stylish and the idea to use a can of soup is one I don't usually resort to, but makes a lot of sense!